The Yuma 2 is a fully-functional field computer featuring the Microsoft® Windows 7 Professional operating system, with a 1.6 Ghz Intel Atom dual-core processor, 4 GB of DDR3 DRAM, a 64 GB solid state drive (SSD) and a dual battery with eight hours of typical run-time. Optional features include a 128 GB SSD, 3.75G cellular data connectivity and an Extended Battery Set that provides up to 16 hours of operation. 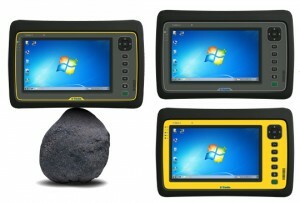 Featuring a new display technology for clear readability even in direct sunlight, the Yuma 2 can be used by workers in the brightest outdoor conditions. As with other Trimble rugged mobile computers, the Yuma 2 is fully ruggedized and meets stringent MIL-STD-810G military standards for drops, vibration and humidity and is rated IP65 for protection against dust and water. Only an inch and a half deep, the Yuma 2 offers a 7 inch capacitive multi-touch screen in a easy-to-hold form factor that measures 6.3 inches x 9.6 inches, and weighs only 2.6 pounds. The 3.75G dual-mode cellular data connectivity enables productivity solutions anywhere GSM or CDMA cellular networks are available. An optional Extended Battery Set provides up to 16 hours of operation. See the Yuma 2 data sheet for complete details.